Special relativity was originally proposed by Albert Einstein in a paper published 26 September 1905 titled "On the Electrodynamics of Moving Bodies". [p 1] The inconsistency of Newtonian mechanics with Maxwell's equations of electromagnetism and the lack of experimental confirmation for a hypothesized luminiferous aether led to the development of special relativity, which corrects mechanics to handle situations involving all motions and especially those at a significant fraction of the speed of light (known as relativistic velocities). Today, special relativity is the most accurate model of motion at any speed when gravitational effects are negligible. Even so, the Newtonian mechanics model is still valid as a simple and high accuracy approximation at low velocities relative to the speed of light. Special relativity implies a wide range of consequences, which have been experimentally verified, including length contraction, time dilation, relativistic mass, mass–energy equivalence, a universal speed limit, the speed of causality and relativity of simultaneity. It has replaced the conventional notion of an absolute universal time with the notion of a time that is dependent on reference frame and spatial position. Rather than an invariant time interval between two events, there is an invariant spacetime interval. Combined with other laws of physics, the two postulates of special relativity predict the equivalence of mass and energy, as expressed in the mass–energy equivalence formula E = mc2, where c is the speed of light in a vacuum. A defining feature of special relativity is the replacement of the Galilean transformations of Newtonian mechanics with the Lorentz transformations. Time and space cannot be defined separately from each other. Rather, space and time are interwoven into a single continuum known as "spacetime". Events that occur at the same time for one observer can occur at different times for another. The theory is "special" in that it only applies in the special case where the spacetime is flat, i.e., the curvature of spacetime, described by the energy-momentum tensor and causing gravity, is negligible. [note 2] In order to correctly accommodate gravity, Einstein formulated general relativity in 1915. Special relativity, contrary to some outdated descriptions, is capable of handling accelerations as well as accelerated frames of reference. As Galilean relativity is now accepted to be an approximation of special relativity that is valid for low speeds, special relativity is considered an approximation of general relativity that is valid for weak gravitational fields, i.e. at a sufficiently small scale (for example, for tidal forces) and in conditions of free fall. Whereas general relativity incorporates noneuclidean geometry in order to represent gravitational effects as the geometric curvature of spacetime, special relativity is restricted to the flat spacetime known as Minkowski space. As long as the universe can be modeled as a pseudo-Riemannian manifold, a Lorentz-invariant frame that abides by special relativity can be defined for a sufficiently small neighborhood of each point in this curved spacetime. 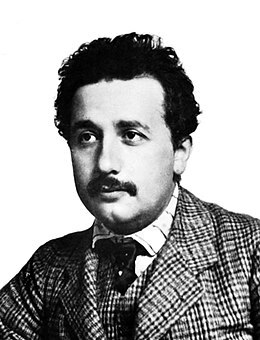 Albert Einstein around 1905, the year his "Annus Mirabilis papers" were published. These included Zur Elektrodynamik bewegter Körper, the paper founding special relativity. The Principle of Invariant Light Speed – "... light is always propagated in empty space with a definite velocity [speed] c which is independent of the state of motion of the emitting body" (from the preface). [p 1] That is, light in vacuum propagates with the speed c (a fixed constant, independent of direction) in at least one system of inertial coordinates (the "stationary system"), regardless of the state of motion of the light source. Figure 2-1. The primed system is in motion relative to the unprimed system with constant velocity v only along the x-axis, from the perspective of an observer stationary in the unprimed system. By the principle of relativity, an observer stationary in the primed system will view a likewise construction except that the velocity they record will be −v. The changing of the speed of propagation of interaction from infinite in non-relativistic mechanics to a finite value will require a modification of the transformation equations mapping events in one frame to another. Reference frames play a crucial role in relativity theory. The term reference frame as used here is an observational perspective in space which is not undergoing any change in motion (acceleration), from which a position can be measured along 3 spatial axes (so, at rest or constant velocity). In addition, a reference frame has the ability to determine measurements of the time of events using a 'clock' (any reference device with uniform periodicity). An event is an occurrence that can be assigned a single unique moment and location in space relative to a reference frame: it is a "point" in spacetime. Since the speed of light is constant in relativity irrespective of reference frame, pulses of light can be used to unambiguously measure distances and refer back the times that events occurred to the clock, even though light takes time to reach the clock after the event has transpired. In relativity theory, we often want to calculate the coordinates of an event from differing reference frames. The equations that relate measurements made in different frames are called transformation equations. To gain insight in how the spacetime coordinates measured by observers in different reference frames compare with each other, it is useful to work with a simplified setup with frames in a standard configuration. :107 With care, this allows simplification of the math with no loss of generality in the conclusions that are reached. In Fig. 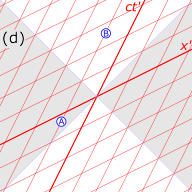 2‑1, two Galilean reference frames (i.e. conventional 3-space frames) are displayed in relative motion. Frame S belongs to a first observer O, and frame S′ (pronounced "S prime" or "S dash") belongs to a second observer O′. Frame S′ moves, for simplicity, in a single direction: the x-direction of frame S with a constant velocity v as measured in frame S.
The origins of frames S and S′ are coincident when time t = 0 for frame S and t′ = 0 for frame S′. Since there is no absolute reference frame in relativity theory, a concept of 'moving' doesn't strictly exist, as everything may be moving with respect to some other reference frame. Instead, any two frames that move at the same speed in the same direction are said to be comoving. Therefore, S and S′ are not comoving. The principle of relativity, which states that physical laws have the same form in each inertial reference frame, dates back to Galileo, and was incorporated into Newtonian physics. However, in the late 19th century, the existence of electromagnetic waves led physicists to suggest that the universe was filled with a substance that they called "aether", which, they postulated, would act as the medium through which these waves, or vibrations, propagated. The aether was thought to be an absolute reference frame against which all speeds could be measured, and could be considered fixed and motionless. Aether supposedly possessed some wonderful properties: it was sufficiently elastic to support electromagnetic waves, and those waves could interact with matter, yet it offered no resistance to bodies passing through it (its one property was that it allowed electromagnetic waves to propagate). The results of various experiments, including the Michelson–Morley experiment in 1887 (subsequently verified with more accurate and innovative experiments), led to the theory of special relativity, by showing that the aether did not exist. Einstein's solution was to discard the notion of an aether and the absolute state of rest. In relativity, any reference frame moving with uniform motion will observe the same laws of physics. In particular, the speed of light in vacuum is always measured to be c, even when measured by multiple systems that are moving at different (but constant) velocities. Rather than considering universal Lorentz covariance to be a derived principle, this article considers it to be the fundamental postulate of special relativity. The traditional two-postulate approach to special relativity is presented in innumerable college textbooks and popular presentations. Textbooks starting with the single postulate of Minkowski spacetime include those by Taylor and Wheeler and by Callahan. This is also the approach followed by the Wikipedia articles Spacetime and Minkowski diagram. is the Lorentz factor and c is the speed of light in vacuum, and the velocity v of S′ is parallel to the x-axis. For simplicity, the y and z coordinates are unaffected; only the x and t coordinates are transformed. These Lorentz transformations form a one-parameter group of linear mappings, that parameter being called rapidity. Enforcing this inverse Lorentz transformation to coincide with the Lorentz transformation from the primed to the unprimed system, shows the unprimed frame as moving with the velocity v′ = −v, as measured in the primed frame. There is nothing special about the x-axis. The transformation can apply to the y- or z-axis, or indeed in any direction, which can be done by directions parallel to the motion (which are warped by the γ factor) and perpendicular; see the article Lorentz transformation for details. Figure 3-1. 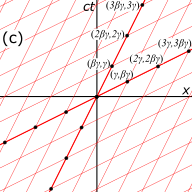 Drawing a Minkowski spacetime diagram to illustrate a Lorentz transformation. Spacetime diagrams (Minkowski diagrams) are an extremely useful aid to visualizing how coordinates transform between different reference frames. Although it is not as easy to perform exact computations using them as directly invoking the Lorentz transformations, their main power is their ability to provide an intuitive grasp of the results of a relativistic scenario. have been plotted on this graph so that their coordinates may be compared in the S and S' frames. are related to the unprimed coordinates through the Lorentz transformations and could be approximately measured from the graph (assuming that it has been plotted accurately enough), but the real merit of a Minkowski diagram is its granting us a geometric view of the scenario. For example, in this figure, we observe that the two timelike-separated events that had different x-coordinates in the unprimed frame are now at the same position in space. While the unprimed frame is drawn with space and time axes that meet at right angles, the primed frame is drawn with axes that meet at acute or obtuse angles. The frames are actually equivalent. The asymmetry is due to unavoidable distortions in how spacetime coordinates map onto a Cartesian plane. By analogy, planar maps of the world are unavoidably distorted, but with experience and intuition, one learns to mentally account for these distortions. The consequences of special relativity can be derived from the Lorentz transformation equations. These transformations, and hence special relativity, lead to different physical predictions than those of Newtonian mechanics at all relative velocities, and most pronounced when relative velocities become comparable to the speed of light. The speed of light is so much larger than anything most humans encounter that some of the effects predicted by relativity are initially counterintuitive. The interweaving of space and time revokes the implicitly assumed concepts of absolute simultaneity and synchronization across non-comoving frames. is hence independent of the frame in which it is measured. is called the proper time. in every inertial frame. In other words, starting from the assumption of universal Lorentz covariance, the constant speed of light is a derived result, rather than a postulate as in the two-postulates formulation of the special theory. Figure 4-1. 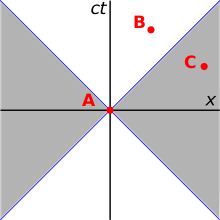 The three events (A, B, C) are simultaneous in the reference frame of some observer O. In a reference frame moving at v = 0.3c, as measured by O, the events occur in the order C, B, A. In a reference frame moving at v = -0.5c with respect to O, the events occur in the order A, B, C. The white lines, the lines of simultaneity, move from the past to the future in the respective frames (green coordinate axes), highlighting events residing on it. They are the locus of all events occurring at the same time in the respective frame. The gray area is the light cone with respect to the origin of all considered frames. Consider two events happening in two different locations that occur simultaneously in the reference frame of one inertial observer. They may occur non-simultaneously in the reference frame of another inertial observer (lack of absolute simultaneity). It is clear that the two events that are simultaneous in frame S (satisfying Δt = 0), are not necessarily simultaneous in another inertial frame S′ (satisfying Δt′ = 0). Only if these events are additionally co-local in frame S (satisfying Δx = 0), will they be simultaneous in another frame S′. The time lapse between two events is not invariant from one observer to another, but is dependent on the relative speeds of the observers' reference frames (e.g., the twin paradox which concerns a twin who flies off in a spaceship traveling near the speed of light and returns to discover that the non-traveling twin sibling has aged much more, the paradox being that at constant velocity we are unable to discern which twin is non-traveling and which twin travels). This shows that the time (Δt′) between the two ticks as seen in the frame in which the clock is moving (S′), is longer than the time (Δt) between these ticks as measured in the rest frame of the clock (S). Time dilation explains a number of physical phenomena; for example, the lifetime of high speed muons created by the collision of cosmic rays with particles in the Earth's outer atmosphere and moving towards the surface is greater than the lifetime of slowly moving muons, created and decaying in a laboratory. Time dilation and length contraction are not merely appearances. Time dilation is explicitly related to our way of measuring time intervals between events which occur at the same place in a given coordinate system (called "co-local" events). These time intervals (which can be, and are, actually measured experimentally by relevant observers) are different in another coordinate system moving with respect to the first, unless the events, in addition to being co-local, are also simultaneous. Similarly, length contraction relates to our measured distances between separated but simultaneous events in a given coordinate system of choice. If these events are not co-local, but are separated by distance (space), they will not occur at the same spatial distance from each other when seen from another moving coordinate system. If an object (for example, a photon) were moving at the speed of light in one frame (i.e. u = ±c or u′ = ±c), then it would also be moving at the speed of light in any other frame, moving at |v| < c.
The resultant speed of two velocities with magnitude less than c is always a velocity with magnitude less than c.
Attaching a frame to a photon (riding a light beam like Einstein considers) requires special treatment of the transformations. There is nothing special about the x direction in the standard configuration. The above formalism applies to any direction; and three orthogonal directions allow dealing with all directions in space by decomposing the velocity vectors to their components in these directions. See Velocity-addition formula for details. The composition of two non-collinear Lorentz boosts (i.e. two non-collinear Lorentz transformations, neither of which involve rotation) results in a Lorentz transformation that is not a pure boost but is the composition of a boost and a rotation.
) rises vertically along the y‑axis in the ground frame. In Fig. 4‑3, the time interval between the events A (the "cause") and B (the "effect") is 'time-like'; i.e., there is a frame of reference in which events A and B occur at the same location in space, separated only by occurring at different times. If A precedes B in that frame, then A precedes B in all frames accessible by a Lorentz transformation. It is possible for matter (or information) to travel (below light speed) from the location of A, starting at the time of A, to the location of B, arriving at the time of B, so there can be a causal relationship (with A the cause and B the effect). 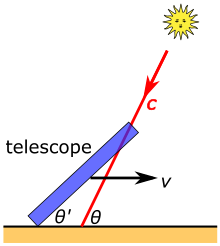 The interval AC in the diagram is 'space-like'; i.e., there is a frame of reference in which events A and C occur simultaneously, separated only in space. 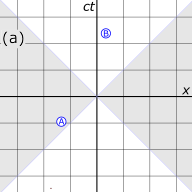 There are also frames in which A precedes C (as shown) and frames in which C precedes A. However, there are no frames accessible by a Lorentz transformation, in which events A and C occur at the same location. If it were possible for a cause-and-effect relationship to exist between events A and C, then paradoxes of causality would result. For example, if signals could be sent faster than light, then signals could be sent into the sender's past (observer B in the diagrams). [p 16] A variety of causal paradoxes could then be constructed. Consider the spacetime diagrams in Fig. 4‑4. A and B stand alongside a railroad track, when a high speed train passes by, with C riding in the last car of the train and D riding in the leading car. The world lines of A and B are vertical (ct), distinguishing the stationary position of these observers on the ground, while the world lines of C and D are tilted forwards (ct′), reflecting the rapid motion of the observers C and D stationary in their train, as observed from the ground. axis, which is a line of simultaneity in the primed frames of C and D. In the (unprimed) ground frame the signal arrives earlier than it was sent. 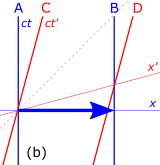 axis, which is a line of simultaneity for the frames of A and B. As seen from the spacetime diagram, B will receive the message before having sent it out, a violation of causality. 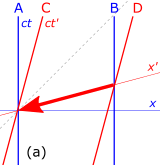 axes can be squeezed very close to the dashed line representing the speed of light. With this modified setup, it can be demonstrated that even signals only slightly faster than the speed of light will result in causality violation. This is not to say that all faster than light speeds are impossible. Various trivial situations can be described where some "things" move faster than light. For example, the location where the beam of a search light hits the bottom of a cloud can move faster than light when the search light is turned rapidly (although we should be clear that this does not violate causality or any other relativistic phenomenon). Figure 5-1. Highly simplified diagram of Fizeau's 1851 experiment. In 1850, Hippolyte Fizeau and Léon Foucault independently established that light travels more slowly in water than in air, thus validating a prediction of Fresnel's wave theory of light and invalidating the corresponding prediction of Newton's corpuscular theory. The speed of light was measured in still water. What would be the speed of light in flowing water? In 1851, Fizeau conducted an experiment to answer this question, a simplified representation of which is illustrated in Fig. 5‑1. 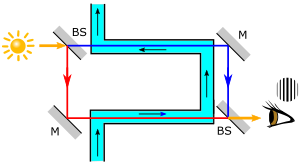 A beam of light is divided by a beam splitter, and the split beams are passed in opposite directions through a tube of flowing water. They are recombined to form interference fringes, indicating a difference in optical path length, that an observer can view. The experiment demonstrated that dragging of the light by the flowing water caused displacement of the fringes, showing that the motion of the water had affected the speed of the light. depends on wavelength, the aether must be capable of sustaining different motions at the same time. [note 8] A variety of theoretical explanations were proposed to explain Fresnel's dragging coefficient that were completely at odds with each other. Even before the Michelson–Morley experiment, Fizeau's experimental results were among a number of observations that created a critical situation in explaining the optics of moving bodies. From the point of view of special relativity, Fizeau's result is nothing but an approximation to Equation 10, the relativistic formula for composition of velocities. Because of the finite speed of light, if the relative motions of a source and receiver include a transverse component, then the direction from which light arrives at the receiver will be displaced from the geometric position in space of the source relative to the receiver. The classical calculation of the displacement takes two forms and makes different predictions depending on whether the receiver, the source, or both are in motion with respect to the medium. (1) If the receiver is in motion, the displacement would be the consequence of the aberration of light. 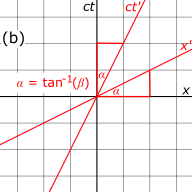 The incident angle of the beam relative to the receiver would be calculable from the vector sum of the receiver's motions and the velocity of the incident light. (2) If the source is in motion, the displacement would be the consequence of light-time correction. The displacement of the apparent position of the source from its geometric position would be the result of the source's motion during the time that its light takes to reach the receiver. The classical explanation failed experimental test. Since the aberration angle depends on the relationship between the velocity of the receiver and the speed of the incident light, passage of the incident light through a refractive medium should change the aberration angle. In 1810, Arago used this expected phenomenon in a failed attempt to measure the speed of light, and in 1870, George Airy tested the hypothesis using a water-filled telescope, finding that, against expectation, the measured aberration was identical to the aberration measured with an air-filled telescope. A "cumbrous" attempt to explain these results used the hypothesis of partial aether-drag, but was incompatible with the results of the Michelson–Morley experiment, which apparently demanded complete aether-drag. The classical Doppler effect depends on whether the source, receiver, or both are in motion with respect to the medium. The relativistic Doppler effect is independent of any medium. Nevertheless, relativistic Doppler shift for the longitudinal case, with source and receiver moving directly towards or away from each other, can be derived as if it were the classical phenomenon, but modified by the addition of a time dilation term, and that is the treatment described here. An identical expression for relativistic Doppler shift is obtained when performing the analysis in the reference frame of the receiver with a moving source. Figure 5-3. Transverse Doppler effect for two scenarios: (a) receiver moving in a circle around the source; (b) source moving in a circle around the receiver. The transverse Doppler effect is one of the main novel predictions of the special theory of relativity. Classically, one might expect that if source and receiver are moving transversely with respect to each other with no longitudinal component to their relative motions, that there should be no Doppler shift in the light arriving at the receiver.
. In Fig. 5‑3b, the light is redshifted by the same factor. Time dilation and length contraction are not optical illusions, but genuine effects. Measurements of these effects are not an artifact of Doppler shift, nor are they the result of neglecting to take into account the time it takes light to travel from an event to an observer. For example, considering time, the elapsed time between two events, measured by identical clocks held by different observers which are moving relative to one another (measured perhaps in seconds), is different. Scientists make a fundamental distinction between measurement or observation on the one hand, versus visual appearance, or what one sees. The measured shape of an object is a hypothetical snapshot of all of the object's points as they exist at a single moment in time. The visual appearance of an object, however, is affected by the varying lengths of time that light takes to travel from different points on the object to one's eye. Figure 5-4. Comparison of the measured length contraction of a cube versus its visual appearance. For many years, the distinction between the two had not been generally appreciated, and it had generally been thought that a length contracted object passing by an observer would in fact actually be seen as length contracted. In 1959, James Terrell and Roger Penrose independently pointed out that differential time lag effects in signals reaching the observer from the different parts of a moving object result in a fast moving object's visual appearance being quite different from its measured shape. For example, a receding object would appear contracted, an approaching object would appear elongated, and a passing object would have a skew appearance that has been likened to a rotation. [p 19][p 20] A sphere in motion retains the appearance of a sphere, although images on the surface of the sphere will appear distorted. 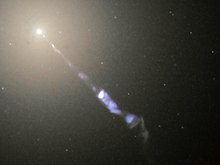 Another example where visual appearance is at odds with measurement comes from the observation of apparent superluminal motion in various radio galaxies, BL Lac objects, quasars, and other astronomical objects that eject relativistic-speed jets of matter at narrow angles with respect to the viewer. An apparent optical illusion results giving the appearance of faster than light travel. In Fig. 5‑5, galaxy M87 streams out a high-speed jet of subatomic particles almost directly towards us, but Penrose–Terrell rotation causes the jet to appear to be moving laterally in the same manner that the appearance of the cube in Fig. 5‑4 has been stretched out. Section Consequences derived from the Lorentz transformation dealt strictly with kinematics, the study of the motion of points, bodies, and systems of bodies without considering the forces that caused the motion. This section discusses masses, forces, energy and so forth, and as such requires consideration of physical effects beyond those encompassed by the Lorentz transformation itself. The energy and momentum are properties of matter and radiation, and it is impossible to deduce that they form a four-vector just from the two basic postulates of special relativity by themselves, because these don't talk about matter or radiation, they only talk about space and time. The derivation therefore requires some additional physical reasoning. In his 1905 paper, Einstein used the additional principles that Newtonian mechanics should hold for slow velocities, so that there is one energy scalar and one three-vector momentum at slow velocities, and that the conservation law for energy and momentum is exactly true in relativity. Furthermore, he assumed that the energy of light is transformed by the same Doppler-shift factor as its frequency, which he had previously shown to be true based on Maxwell's equations. [p 1] The first of Einstein's papers on this subject was "Does the Inertia of a Body Depend upon its Energy Content?" in 1905. [p 21] Although Einstein's argument in this paper is nearly universally accepted by physicists as correct, even self-evident, many authors over the years have suggested that it is wrong. Other authors suggest that the argument was merely inconclusive because it relied on some implicit assumptions. where v(t) is the velocity at a time t, a is the acceleration of 1g and t is the time as measured by people on Earth. [p 23] Therefore, after one year of accelerating at 9.81 m/s2, the spaceship will be travelling at v = 0.77c relative to Earth. Time dilation will increase the travellers life span as seen from the reference frame of the Earth to 2.7 years, but his lifespan measured by a clock travelling with him will not change. During his journey, people on Earth will experience more time than he does. A 5-year round trip for him will take 6.5 Earth years and cover a distance of over 6 light-years. A 20-year round trip for him (5 years accelerating, 5 decelerating, twice each) will land him back on Earth having travelled for 335 Earth years and a distance of 331 light years. A full 40-year trip at 1g will appear on Earth to last 58,000 years and cover a distance of 55,000 light years. A 40-year trip at 1.1g will take 148,000 Earth years and cover about 140,000 light years. A one-way 28 year (14 years accelerating, 14 decelerating as measured with the astronaut's clock) trip at 1g acceleration could reach 2,000,000 light-years to the Andromeda Galaxy. This same time dilation is why a muon travelling close to c is observed to travel much farther than c times its half-life (when at rest). In 1928, Paul Dirac constructed an influential relativistic wave equation, now known as the Dirac equation in his honour,[p 24] that is fully compatible both with special relativity and with the final version of quantum theory existing after 1926. This equation explained not only the intrinsic angular momentum of the electrons called spin, it also led to the prediction of the antiparticle of the electron (the positron),[p 24][p 25] and fine structure could only be fully explained with special relativity. It was the first foundation of relativistic quantum mechanics. In non-relativistic quantum mechanics, spin is phenomenological and cannot be explained. Figure 10-1. 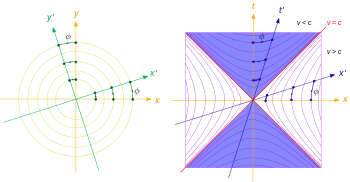 Orthogonality and rotation of coordinate systems compared between left: Euclidean space through circular angle φ, right: in Minkowski spacetime through hyperbolic angle φ (red lines labelled c denote the worldlines of a light signal, a vector is orthogonal to itself if it lies on this line). where dX = (dX0, dX1, dX2, dX3) are the differentials of the four spacetime dimensions. This suggests a deep theoretical insight: special relativity is simply a rotational symmetry of our spacetime, analogous to the rotational symmetry of Euclidean space (see Fig. 10‑1). Just as Euclidean space uses a Euclidean metric, so spacetime uses a Minkowski metric. Basically, special relativity can be stated as the invariance of any spacetime interval (that is the 4D distance between any two events) when viewed from any inertial reference frame. All equations and effects of special relativity can be derived from this rotational symmetry (the Poincaré group) of Minkowski spacetime. which is the equation of a circle of radius c dt. Figure 10-3. 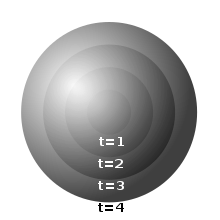 Concentric spheres, illustrating in 3-space the null geodesics of a 4-dimensional cone in spacetime. As illustrated in Fig. 10‑3, the null geodesics can be visualized as a set of continuous concentric spheres with radii = c dt.
. All tensors transform by this rule. , in those frames. Throughout we use the signs as above, different authors use different conventions – see Minkowski metric alternative signs. ^ a b c d e Albert Einstein (1905) "Zur Elektrodynamik bewegter Körper", Annalen der Physik 17: 891; English translation On the Electrodynamics of Moving Bodies by George Barker Jeffery and Wilfrid Perrett (1923); Another English translation On the Electrodynamics of Moving Bodies by Megh Nad Saha (1920). ^ Science and Common Sense, P. W. Bridgman, The Scientific Monthly, Vol. 79, No. 1 (Jul., 1954), pp. 32-39. ^ a b Einstein, Autobiographical Notes, 1949. ^ Einstein, On the Relativity Principle and the Conclusions Drawn from It, 1907; "The Principle of Relativity and Its Consequences in Modern Physics", 1910; "The Theory of Relativity", 1911; Manuscript on the Special Theory of Relativity, 1912; Theory of Relativity, 1913; Einstein, Relativity, the Special and General Theory, 1916; The Principal Ideas of the Theory of Relativity, 1916; What Is The Theory of Relativity?, 1919; The Principle of Relativity (Princeton Lectures), 1921; Physics and Reality, 1936; The Theory of Relativity, 1949. ^ Yaakov Friedman (2004). Physical Applications of Homogeneous Balls. Progress in Mathematical Physics. 40. pp. 1–21. ISBN 978-0-8176-3339-4. ^ Das, A. (1993) The Special Theory of Relativity, A Mathematical Exposition, Springer, ISBN 0-387-94042-1. ^ Schutz, J. (1997) Independent Axioms for Minkowski Spacetime, Addison Wesley Longman Limited, ISBN 0-582-31760-6. ^ Lorentz, H.A. (1902). "The rotation of the plane of polarization in moving media" (PDF). Huygens Institute - Royal Netherlands Academy of Arts and Sciences (KNAW). 4: 669–678. Bibcode:1901KNAB....4..669L. Retrieved 15 November 2018. ^ a b Lorentz, H. A. (1904). "Electromagnetic phenomena in a system moving with any velocity smaller than that of light" (PDF). Huygens Institute - Royal Netherlands Academy of Arts and Sciences (KNAW). 6: 809–831. Bibcode:1903KNAB....6..809L. Retrieved 15 November 2018. ^ Lorentz, Hendrik (1895). "Investigation of oscillations excited by oscillating ions". Attempt at a Theory of Electrical and Optical Phenomena in Moving Bodies (Versuch einer Theorie der electrischen und optischen Erscheinungen in bewegten Körpern). Leiden: E. J. Brill. (subsection § 31). ^ Lin, Shih-Chun; Giallorenzi, Thomas G. (1979). "Sensitivity analysis of the Sagnac-effect optical-fiber ring interferometer". Applied Optics. 18 (6): 915–931. Bibcode:1979ApOpt..18..915L. doi:10.1364/AO.18.000915. PMID 20208844. ^ Shaw, R. (1962). "Length Contraction Paradox". American Journal of Physics. 30 (1): 72. Bibcode:1962AmJPh..30...72S. doi:10.1119/1.1941907. ^ G. A. Benford; D. L. Book & W. A. Newcomb (1970). "The Tachyonic Antitelephone". Physical Review D. 2 (2): 263. Bibcode:1970PhRvD...2..263B. doi:10.1103/PhysRevD.2.263. ^ Zeeman, Pieter (1914). "Fresnel's coefficient for light of different colours. (First part)". Proc. Kon. Acad. Van Weten. 17: 445–451. Bibcode:1914KNAB...17..445Z. ^ Zeeman, Pieter (1915). "Fresnel's coefficient for light of different colours. (Second part)". Proc. Kon. Acad. Van Weten. 18: 398–408. Bibcode:1915KNAB...18..398Z. ^ Terrell, James (15 November 1959). "Invisibility of the Lorentz Contraction". Physical Review. 116 (4): 1041–1045. Bibcode:1959PhRv..116.1041T. doi:10.1103/PhysRev.116.1041. ^ Penrose, Roger (24 October 2008). "The Apparent Shape of a Relativistically Moving Sphere". Mathematical Proceedings of the Cambridge Philosophical Society. 55 (1): 137. Bibcode:1959PCPS...55..137P. doi:10.1017/S0305004100033776. ^ Baglio, Julien (26 May 2007). "Acceleration in special relativity: What is the meaning of "uniformly accelerated movement" ?" (PDF). Physics Department, ENS Cachan. Retrieved 22 January 2016. ^ a b P.A.M. Dirac (1930). "A Theory of Electrons and Protons" (PDF). Proceedings of the Royal Society. A126 (801): 360–365. Bibcode:1930RSPSA.126..360D. doi:10.1098/rspa.1930.0013. JSTOR 95359. ^ C.D. Anderson (1933). "The Positive Electron". Phys. Rev. 43 (6): 491–494. Bibcode:1933PhRv...43..491A. doi:10.1103/PhysRev.43.491. ^ Tom Roberts & Siegmar Schleif (October 2007). "What is the experimental basis of Special Relativity?". Usenet Physics FAQ. Retrieved 2008-09-17. ^ Albert Einstein (2001). Relativity: The Special and the General Theory (Reprint of 1920 translation by Robert W. Lawson ed.). Routledge. p. 48. ISBN 978-0-415-25384-0. ^ Richard Phillips Feynman (1998). Six Not-so-easy Pieces: Einstein's relativity, symmetry, and space–time (Reprint of 1995 ed.). Basic Books. p. 68. ISBN 978-0-201-32842-4. ^ Edwin F. Taylor & John Archibald Wheeler (1992). Spacetime Physics: Introduction to Special Relativity. W. H. Freeman. ISBN 978-0-7167-2327-1. ^ a b c Rindler, Wolfgang (1977). Essential Relativity: Special, General, and Cosmological (illustrated ed.). Springer Science & Business Media. p. §1,11 p. 7. ISBN 978-3-540-07970-5. ^ a b Jeroen van Dongen (2009). "On the role of the Michelson–Morley experiment: Einstein in Chicago". Archive for History of Exact Sciences. 63 (6): 655–663. arXiv:0908.1545. Bibcode:2009arXiv0908.1545V. doi:10.1007/s00407-009-0050-5. ^ a b c d e f g h David Morin (2007) Introduction to Classical Mechanics, Cambridge University Press, Cambridge, chapter 11, Appendix I, ISBN 1-139-46837-5. ^ Miller, D. J. (2010). "A constructive approach to the special theory of relativity". American Journal of Physics. 78 (6): 633–638. arXiv:0907.0902. Bibcode:2010AmJPh..78..633M. doi:10.1119/1.3298908. ^ Taylor, Edwin; Wheeler, John Archibald (1992). Spacetime Physics (2nd ed.). W.H. Freeman & Co. ISBN 978-0-7167-2327-1. ^ Callahan, James J. (2011). The Geometry of Spacetime: An Introduction to Special and General Relativity. New York: Springer. ISBN 9781441931429. ^ Mermin, N. David (1968). Space and Time in Special Relativity. McGraw-Hill. ISBN 978-0881334203. ^ Robert Resnick (1968). Introduction to special relativity. Wiley. pp. 62–63. ^ a b Miller, Arthur I. (1998). Albert Einstein's Special Theory of Relativity: Emergence (1905) and Early Interpretation (1905-1911). Mew York: Springer-Verlag. ISBN 978-0-387-94870-6. ^ Bernstein, Jeremy (2006). Secrets of the Old One: Einstein, 1905. Copernicus Books (imprint of Springer Science + Business Media). ISBN 978-0387-26005-1. ^ Darrigol, Olivier (2005). "The Genesis of the Theory of Relativity" (PDF). Séminaire Poincaré. 1: 1–22. Bibcode:2006eins.book....1D. Retrieved 15 November 2018. ^ a b c Rindler, Wolfgang (1977). Essential Relativity (2nd ed.). New York: Springer-Verlag. ISBN 978-0-387-10090-6. ^ a b c d Taylor, Edwin F.; Wheeler, John Archibald (1966). Spacetime Physics (1st ed.). San Francisco: W. H. Freeman and Company. ^ Ashby, Neil (2003). "Relativity in the Global Positioning System". Living Reviews in Relativity. 6 (1): 1. Bibcode:2003LRR.....6....1A. doi:10.12942/lrr-2003-1. PMC 5253894. PMID 28163638. ^ Daniel Kleppner & David Kolenkow (1973). An Introduction to Mechanics. pp. 468–70. ISBN 978-0-07-035048-9. ^ Tolman, Richard C. (1917). The Theory of the Relativity of Motion. Berkeley: University of California Press. p. 54. ^ Takeuchi, Tatsu. "Special Relativity Lecture Notes - Section 10". Virginia Tech. Retrieved 31 October 2018. ^ Morin, David (2017). Special Relativity for the Enthusiastic Beginner. CreateSpace Independent Publishing Platform. pp. 90–92. ISBN 9781542323512. ^ Gibbs, Philip. "Is Faster-Than-Light Travel or Communication Possible?". Physics FAQ. Department of Mathematics, University of California, Riverside. Retrieved 31 October 2018. ^ Lauginie, P. (2004). "Measuring Speed of Light: Why? Speed of what?" (PDF). Proceedings of the Fifth International Conference for History of Science in Science Education. Archived from the original (PDF) on 4 July 2015. Retrieved 3 July 2015. ^ Stachel, J. (2005). "Fresnel's (dragging) coefficient as a challenge to 19th century optics of moving bodies". In Kox, A.J. ; Eisenstaedt, J (eds.). The universe of general relativity. Boston: Birkhäuser. pp. 1–13. ISBN 978-0-8176-4380-5. Retrieved 17 April 2012. ^ Richard A. Mould (2001). Basic Relativity (2nd ed.). Springer. p. 8. ISBN 978-0-387-95210-9. ^ Seidelmann, P. Kenneth, ed. (1992). Explanatory Supplement to the Astronomical Almanac. ill Valley, Calif.: University Science Books. p. 393. ISBN 978-0-935702-68-2. ^ Ferraro, Rafael; Sforza, Daniel M. (2005). "European Physical Society logo Arago (1810): the first experimental result against the ether". European Journal of Physics. 26: 195. arXiv:physics/0412055. doi:10.1088/0143-0807/26/1/020. ^ Dolan, Graham. "Airy's Water Telescope (1870)". The Royal Observatory Greenwich. Retrieved 20 November 2018. ^ Hollis, H. P. (1937). "Airy's water telescope". The Observatory. 60: 103–107. Bibcode:1937Obs....60..103H. Retrieved 20 November 2018. ^ Janssen, Michel; Stachel, John (2004). "The Optics and Electrodynamics of Moving Bodies" (PDF). In Stachel, John (ed.). Going Critical. Springer. ISBN 978-1-4020-1308-9. ^ Sher, D. (1968). "The Relativistic Doppler Effect". Journal of the Royal Astronomical Society of Canada. 62: 105–111. Retrieved 11 October 2018. ^ Gill, T. P. (1965). The Doppler Effect. London: Logos Press Limited. pp. 6–9. Retrieved 12 October 2018. ^ Feynman, Richard P.; Leighton, Robert B.; Sands, Matthew (February 1977). "Relativistic Effects in Radiation". The Feynman Lectures on Physics: Volume 1. Reading, Massachusetts: Addison-Wesley. pp. 34–7 f. ISBN 9780201021165. LCCN 2010938208. ^ Cook, Helen. "Relativistic Distortion". Mathematics Department, University of British Columbia. Retrieved 12 April 2017. ^ Signell, Peter. "Appearances at Relativistic Speeds" (PDF). Project PHYSNET. Michigan State University, East Lansing, MI. Archived from the original (PDF) on 12 April 2017. Retrieved 12 April 2017. ^ Kraus, Ute. "The Ball is Round". Space Time Travel: Relativity visualized. Institut für Physik Universität Hildesheim. Archived from the original on 16 April 2017. Retrieved 16 April 2017. ^ Zensus, J. Anton; Pearson, Timothy J. (1987). Superluminal Radio Sources (1st ed.). Cambridge, New York: Cambridge University Press. p. 3. ISBN 9780521345606. ^ Chase, Scott I. "Apparent Superluminal Velocity of Galaxies". The Original Usenet Physics FAQ. Department of Mathematics, University of California, Riverside. Retrieved 12 April 2017. ^ Richmond, Michael. ""Superluminal" motions in astronomical sources". Physics 200 Lecture Notes. School of Physics and Astronomy, Rochester Institute of Technology. Archived from the original on 20 April 2017. Retrieved 20 April 2017. ^ Keel, Bill. "Jets, Superluminal Motion, and Gamma-Ray Bursts". Galaxies and the Universe - WWW Course Notes. Department of Physics and Astronomy, University of Alabama. Archived from the original on 29 April 2017. Retrieved 29 April 2017. ^ Max Jammer (1997). Concepts of Mass in Classical and Modern Physics. Courier Dover Publications. pp. 177–178. ISBN 978-0-486-29998-3. ^ John J. Stachel (2002). Einstein from B to Z. Springer. p. 221. ISBN 978-0-8176-4143-6. ^ a b Philip Gibbs & Don Koks. "The Relativistic Rocket". Retrieved 30 August 2012. ^ The special theory of relativity shows that time and space are affected by motion Archived 2012-10-21 at the Wayback Machine. Library.thinkquest.org. Retrieved on 2013-04-24. ^ E. J. Post (1962). Formal Structure of Electromagnetics: General Covariance and Electromagnetics. Dover Publications Inc. ISBN 978-0-486-65427-0. ^ R. Resnick; R. Eisberg (1985). Quantum Physics of Atoms, Molecules, Solids, Nuclei and Particles (2nd ed.). John Wiley & Sons. pp. 114–116. ISBN 978-0-471-87373-0. Sidney Coleman; Sheldon L. Glashow (1997). "Cosmic Ray and Neutrino Tests of Special Relativity". Physics Letters B. 405 (3–4): 249–252. arXiv:hep-ph/9703240. Bibcode:1997PhLB..405..249C. doi:10.1016/S0370-2693(97)00638-2. ^ John D. Norton, John D. (2004). "Einstein's Investigations of Galilean Covariant Electrodynamics prior to 1905". Archive for History of Exact Sciences. 59 (1): 45–105. Bibcode:2004AHES...59...45N. doi:10.1007/s00407-004-0085-6. ^ J.A. Wheeler; C. Misner; K.S. Thorne (1973). Gravitation. W.H. Freeman & Co. p. 58. ISBN 978-0-7167-0344-0. ^ J.R. Forshaw; A.G. Smith (2009). Dynamics and Relativity. Wiley. p. 247. ISBN 978-0-470-01460-8. ^ R. Penrose (2007). The Road to Reality. Vintage books. ISBN 978-0-679-77631-4. ^ Sean M. Carroll (2004). Spacetime and Geometry: An Introduction to General Relativity. Addison Wesley. p. 22. ISBN 978-0-8053-8732-2. ^ Wald, General Relativity, p. 60: "...the special theory of relativity asserts that spacetime is the manifold ℝ4 with a flat metric of Lorentz signature defined on it. Conversely, the entire content of special relativity ... is contained in this statement ..."
^ In a spacetime setting, the length of a rigid object is the spatial distance between the ends of the object measured at the same time. Lorentz expected that length contraction would result in compressive strains in an object that should result in measurable effects. Such effects would include optical effects in transparent media, such as optical rotation[p 11] and induction of double refraction,[p 12] and the induction of torques on charged condensers moving at an angle with respect to the aether. [p 12] Lorentz was perplexed by experiments such as the Trouton–Noble experiment and the experiments of Rayleigh and Brace which failed to validate his theoretical expectations. Impressed by Lorentz's "most ingenious idea", Poincaré saw more in local time than a mere mathematical trick. It represented the actual time that would be shown on a moving observer's clocks. On the other hand, Poincaré did not consider this measured time to be the "true time" that would be exhibited by clocks at rest in the aether. Poincaré made no attempt to redefine the concepts of space and time. 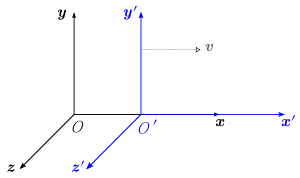 To Poincaré, Lorentz transformation described the apparent states of the field for a moving observer. True states remained those defined with respect to the ether. is also an invariant, generated by a variant of the metric signature of spacetime. ^ The invariance of Δs2 under standard Lorentz transformation in analogous to the invariance of squared distances Δr2 under rotations in Euclidean space. Although space and time have an equal footing in relativity, the minus sign in front of the spatial terms marks space and time as being of essentially different character. They are not the same. Because it treats time differently than it treats the 3 spatial dimensions, Minkowski space differs from four-dimensional Euclidean space. ^ Even though it has been many decades since Terrell and Penrose published their observations, popular writings continue to conflate measurement versus appearance. For example, Michio Kaku wrote in Einstein's Cosmos (W. W. Norton & Company, 2004. p. 65): "... imagine that the speed of light is only 20 miles per hour. If a car were to go down the street, it might look compressed in the direction of motion, being squeezed like an accordion down to perhaps 1 inch in length." ^ In a letter to Carl Seelig in 1955, Einstein wrote "I had already previously found that Maxwell's theory did not account for the micro-structure of radiation and could therefore have no general validity. ", Einstein letter to Carl Seelig, 1955. Qadir, Asghar (1989). Relativity: An Introduction to the Special Theory. Singapore: World Scientific Publications. p. 128. Bibcode:1989rist.book.....Q. ISBN 978-9971-5-0612-4. French, A. P. (1968). Special Relativity (M.I.T. Introductory Physics) (1st ed.). W. W. Norton & Company. ISBN 978-0393097931. Lawrence Sklar (1977). Space, Time and Spacetime. University of California Press. ISBN 978-0-520-03174-6. Lawrence Sklar (1992). Philosophy of Physics. Westview Press. ISBN 978-0-8133-0625-4.